Water reuse offers significant benefits to integrated management of stressed water countries and regions as a dependable alternative water source. There is a substantial range of water reuse practices already applied worldwide, many of these in Europe. 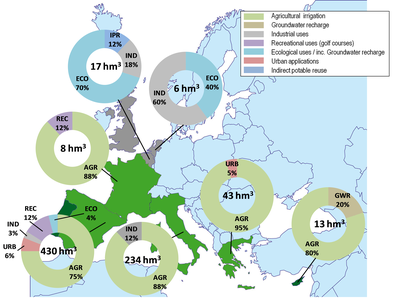 The freshwater replacement potential through water reuse was estimated to vary between 1-17% in European countries with even higher effects on local and regional scale. Inconsistent and unreliable methods for identification and optimization of appropriate wastewater treatment technologies for reuse applications which are able to balance the competing demands of sustainable processes. Difficulty in specifying and selecting effective whole system monitoring techniques and technologies. Significant challenges in reliably assessing the environmental and public health risk / benefit of water reuse across a range of geographical application scales. Poorly developed business models for water reuse schemes and markets for recycled water. Low levels of public and government enthusiasm for water reuse. Lack of a unifying identity and professional image for the European water reuse sector. Objective 2. To demonstrate advanced monitoring and control options for the assurance of desired routes/fate of water constituents (pathogens, contaminants and nutrients) in various water recycling schemes (WP2). Objective 3. To demonstrate how through the assessment and management of environmental and human health risks the socio-economic and environmental benefits of water reuse schemes can be maximized while negative health and environmental impacts are kept to a minimum (WP3). Objective 4. To increase and promote the marketability of water reuse schemes (WP4). Objective 5. To improve the ability of reuse scheme operators to deliver socially acceptable projects within collaborative and effective governance regimes (WP5). Objective 6. To promote a wider understanding and awareness of water reuse practices among public administrations and end-users (WP7). Objective 7. To create and nurture an identity and knowledge base for the nascent European water reuse sector (WP8).